Start Making Money Online, Kaymu Affiliate now Jumia Market is a online marketplace that deals with selling of New and Used item. Start Making Money Online, Kaymu Affiliate Program ! Kaymu is Nigeria’s biggest online marketplace. The platform is where buyers and sellers meet to make awesome deals. Their offer thousands of products at the best available prices online. Do you want to take your website or blog to the next level? Through our affiliate program, you can turn your website or blog into a money making machine! Simply drive traffic to our online store by choosing from thousands of products to advertise to customers and make money when your visitors buy from them. Unlimited earning potential; the more visitors buy the more you earn. Promote a huge range of over 190,000 products? Join Kaymu’s affiliate program today and create a new source of income. 2. You will earn N700 commission per sale, when someone you referred buy from Jumia market (through your unique affiliate link). 3. You will earn N300 commission (per referred Affiliate), when Jumia market approves anyone you refer to join their affiliate program. 4. You will earn N700 as flat commission per any product you sell through your unique affiliate link irrespective of the price of the item sold. 5. If you get more than 100 valid Sales in one week, you will earn N1,500 per transaction generated the following week. When signup you can still earn extra #300 for any referral you introduce to the program. 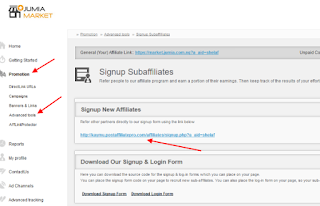 To do this, You can get it by login to your affiliate account, navigating to “Promotion’ > “Advanced Tools” > ‘Sign Up Sub-affiliates”.